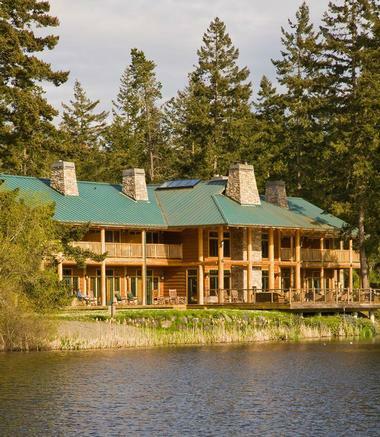 Set on 82 acres of land and surrounded by three lakes on the beautiful San Juan Island in Washington State, Lakedale Resort at Three Lakes is a family-friendly vacation resort that offers a variety of comfortable accommodation and array of fun activities. 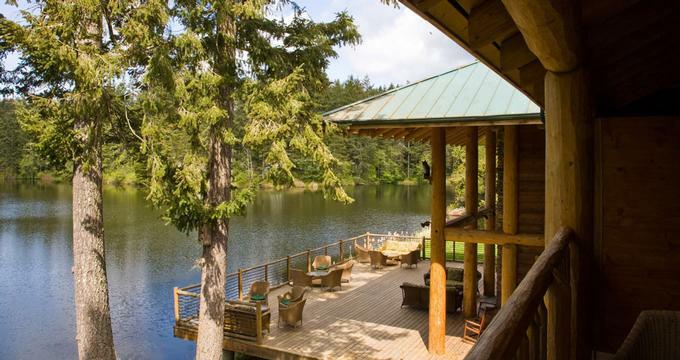 Nestled between Friday Harbor and Roche Harbor on San Juan Island in Washington, Lakedale Resort is easily accessible by ferry or floatplane from Seattle and promises one-of-a-kind holiday experience. Accommodation ranges from serene adults-only lodge rooms and suites with whirlpool tubs and fireplaces to cozy fully equipped log cabins for families, glamping tents and basic campsites for those who prefer getting back to nature. Complimentary breakfast is served at the main lodge for all guests at the resort, and an array of recreational activities and adventures, including hiking, mountain biking, court sports, boating, fishing and more will keep outdoor enthusiasts happy. Further afield, the island of San Juan offers many more adventures including cycling tours, wine tasting, sea kayaking, whale watching, salt-water fishing, and local artisan tours. Lakedale Resort features a variety of accommodation options, including a 10-room lodge, cozy log cabins, canvas glamping tents, and standard campsites. Lodge guestrooms are offered in three different styles - luxurious lake view rooms that have two full-size beds or one queen bed, deluxe rooms with wet bars, refrigerators, and beautiful lake views, and two-room suites with lovely woodland views. All guest rooms in the lodge have gas fireplaces, en-suite bathrooms with showers and jetted bathtubs, private decks or balconies and complimentary wireless Internet access. A shared DVD library offers a wide selection of complimentary DVDs for guests to enjoy. 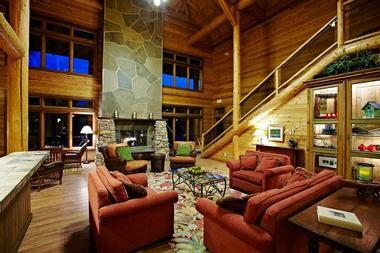 Six spacious and cozy log cabins can accommodate up to six guests and are perfect for families needing a bit more room. The charming cabins feature two bedrooms with king or queen size beds, a master en suite bathroom with shower and bath, and two full separate bathrooms with showers and baths. A fully equipped kitchen has all the necessary appliances and utensils for easy holiday living, and a dining nook has a table and chairs for family meals. A sunny sitting area has a pull put sofa bed for extra guests, a gas fireplace and a opens onto a large cedar deck with beautiful forest views. An outdoor grill is ideal for alfresco dining under the stars or relaxing in front of the crackling campfire. The Lake House offers a home-away-from-home ambiance with modern amenities to create a comfortable abode for families and groups of friends. The Lake House features three bedrooms, each with one queen-size bed, and a roomy loft with a two-sleeper futon-style bed and a pull-out sleeper sofa that sleeps two. Bathrooms have showers and jetted bathtubs while a cozy sitting area has comfortable sofas, television with DVD player (no satellite), and a wood-burning fireplace, and a separate dining room and fully equipped kitchen are ideal for entertaining. 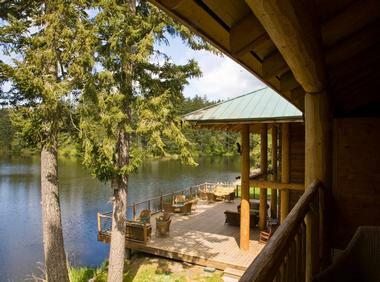 A large cedar deck overlooks the forest, and there are an outdoor fire pit and grill for alfresco dining and relaxing by the campfire. Complimentary wireless Internet is available at the Lake House, and a shared DVD library offers a wide selection of complimentary DVDs for guests to enjoy. If you want to get closer to nature but prefer to have a few creature comforts, Lakeside Resort’s custom-built canvas cabins are ideal. 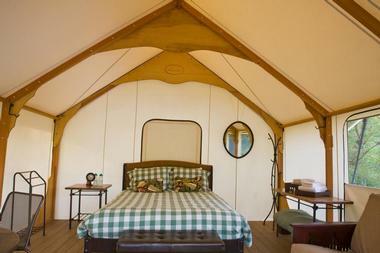 Offering an upscale, unique ‘glamping’ experience, Standard Canvas Cabins are 225 square feet in size and feature one queen-size bed with cotton sheets, pillow-top bedding, thick pillows and a flannel duvet. Spacious living areas have a full-size futon-style bed that sleeps two people, a table and four chairs for meals, fresh bath linens, and a cordless lantern. Canvas Cabins also have an outside picnic table with four chairs, an umbrella, and a fire pit, and a personalized Toasty Toes turndown service includes a delivery of two fleece-covered hot water bottles to your tent every evening. Lakeside Resort’s campsites do not have electricity, running water, or internet service, and it is a short walk to the shower facilities. Lakedale’s Canvas Cottage offers extra levels of luxury with a king-size bed, a private bathroom with shower, a spacious living area with chandelier, and electricity. The Canvas Cottage has a stunning lakeside setting and is perfect for a romantic getaway. The Canvas Cottage also has an outside picnic table with four chairs, an umbrella, and a fire pit and a personalized Toasty Toes turndown service include a delivery of two fleece-covered hot water bottles to your tent every evening. Lakedale’s Duplex Canvas Cabins feature two canvas cabins next to each other that are ideal for two families vacationing together but wanting their own separate living spaces and privacy. The 450-square-foot Canvas Bunkhouse is perfect for groups of up to six guests and features two queen-size beds, a full-size two-sleeper futon-style bed, and electricity. Duplex Canvas Cabins also have an outside picnic table with four chairs, an umbrella, and a fire pit, and a personalized Toasty Toes turndown service includes a delivery of two fleece-covered hot water bottles to your tent every evening. A modern toilet and shower block offers restrooms and token-operated showers to guests, and complimentary wireless internet is available at the General Store. Lakedale Resort is home to a fully renovated 1978 Excella Airstream that offers a unique, retro camping experience. Located on a beautiful site overlooking the lake, the Airstream features a double bed with plush linens, private bathroom with a shower, toilet and vanity and climate control. A cozy kitchenette has a cooktop stove, microwave, refrigerator and foldable dinette table, and an extended sofa converts into a full-size sleeping for extra guests or kids. The trailer also offers a television and DVD player (no satellite), luggage storage and LED lighting throughout. A shared DVD library offers a wide selection of complimentary DVDs for guests to enjoy. Lakedale Resort has a campground with standard campsites that are ideally situated to experience the natural beauty of San Juan. Conveniently located just a few miles north of the ferry landing at Friday Harbor and Roche Harbor Marina, Lakedale’s campground has three tranquil swimming lakes, and an array of equipment for rent, including kayaks, canoes, paddle boats, stand-up paddle boards, and row boats. The lakes are well stocked with bass and trout for fishing. 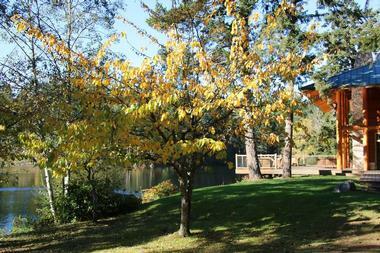 The Lakedale Resort Campground offers a variety of campsites. Classic Campsites cater for two tents and one vehicle and feature a picnic table and a fire pit, while Lakeside Campsites overlook one of the three lakes, can accommodate two tents, one vehicle and have picnic table and fire pits. Family Campsites are ideal for larger groups or families, with enough space for four tents and two vehicles. Each campsite has a picnic table and a fire pit while Lakeside Family Campsites overlook one of the three lakes, can accommodate four tents, two vehicles and have picnic table and fire pits. Double Family Campsites can fit eight tents, four vehicles and have two fire pits and four picnic tables, while special Hike-In/Bike-In Campsites do not have space for cars, but can cater for one or two small individual tents and offer a picnic table and fire pit for hikers and/or cyclists. The campground features modern spotlessly clean shower facilities with token-operated showers, toilets, vanities, and skylights. Guests staying at the Lakedale Resort can enjoy a complimentary breakfast at the Resort Lodge, which includes daily egg dish of fried, poached, or scrambled eggs, Lakedale’s Signature Granola and choice of cereals. Also included is Greek yogurt, oatmeal, pancakes, fresh fruit, freshly baked bread, English muffins, pastries, homemade jams, self-serve espresso, coffee, tea and hot chocolate. Lakedale Resort presents a fantastic destination for special occasions such as weddings, receptions, team-building events and business meetings. Boasting beautiful views over Lake Neva, the Lodge Dining Room is the perfect setting for weddings, receptions and meetings, while the Lodge’s adjoining deck adds extra space for pre- or post-event cocktails. Situated on 82 beautifully scenic acres, Lakedale Resort offers a wealth of unlimited outdoor activities, ranging from a giant chess set, horseshoes, ping pong games, bocce ball, and bird watching. Three freshwater lakes are fully stocked with trout and bass for excellent fishing and are ideal for swimming, stand-up paddle boarding, canoeing, kayaking, and row boating. During the summer season, the resort offers a variety of activities for the whole families, including volleyball, boat races, tie-dye T-shirt making, birdhouse painting, jewelry-making, and campfire cooking classes. The Resort’s General Store is stocked with a range of goods, from camping and fishing gear, including bait to clothing, groceries, ice, and wood. The Picnic Pantry offers a delicious variety of pre-prepped food, such as freshly made sandwiches, crisp garden salads, and homemade sweet treats, as well as regional beers, wine, hot coffee and cappuccino. Surrounded by three lakes on the beautiful island of San Juan, Lakedale Resort is within close proximity to some fun activities and adventures for the whole family from art galleries and museums to parks, gardens, and trendy restaurants. Friday Harbor is a quaint harbor town in summer and a charming haven in winter, with much to see and do, while Roche Harbor is situated at the north end of the island and is home to a tranquil marina and historical lime production landmark. Visit the Lime Kiln State Park on the west side of the island to see the magnificent Orca whales when they are in residence from March through November or explore the national parks of English and American Camps and learn more about the infamous Pig War of 1859. San Juan Island is also home to an alpaca farm, a lavender farm, and a weekly Farmer’s Market which sells an array of fresh produce and craft goods.